Samsung has launched the new 860 PRO (2.5-inch form factor) and 860 EVO (2.5-inch, mSATA, and M.2 form factor) SSDs. These drives utilise Samsung’s latest 64 layer V-NAND technology and MJX controller and are designed for anyone who requires fast, reliable performance on the ubiquitous, and usually plentiful, SATA connector. Un-Soo Kim, SVP of Brand Product Marketing, Memory Business at Samsung Electronics, said that the new 860 PRO and 860 EVO SSDs “combine the latest 512Gb and 256Gb 64-layer V-NAND, up to 4GB LPDDR4 mobile DRAM and a new MJX controller to elevate the user experience for both consumers and businesses”. Samsung says that the new MJX controller is faster than on previous SATA drives, capable enough for workstation use, and has improved Linux compatibility.. The new drives, the successors to the popular 850 PRO and 850 EVO, support up to 560MB/s read and 530MB/s write speeds, and deliver up to 100K IOPS. Durability is another highlighted feature of the new drives. 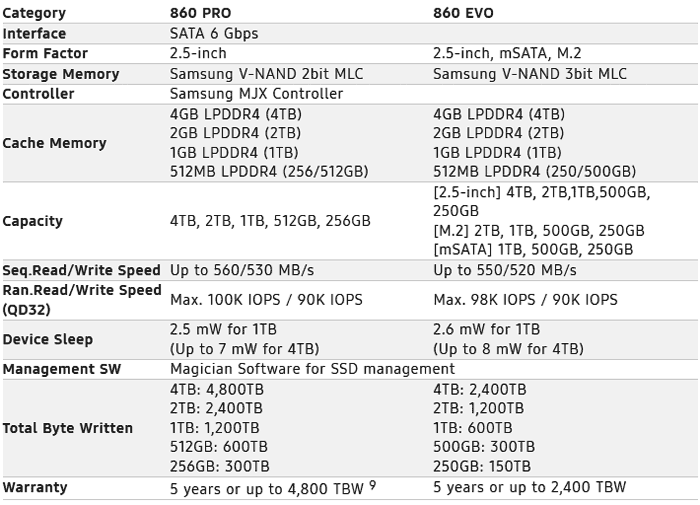 Samsung rates the 860 PRO for up to 4,800 terabytes written (TBW), and the 860 EVO for up to 2,400 TBW. It backs up these figures by extending the warranties of the 860 SSDs to five years. Samsung will be making the 860 PRO available in 256GB, 512GB, 1TB, 2TB and 4TB capacities. As a 2.5-inch only form factor series it is targeted at PCs, laptops, workstations and NAS. The 860 EVO comes in 250GB, 500GB, 1TB, 2TB and 4TB capacities and offers greater form factor flexibility (2.5-inch, mSATA, and M.2 form factors). Emphasising the advancements made in the EVO series, Samsung says that the 860 EVO has up to six times longer sustained performance than its predecessor due to enhanced Intelligent TurboWrite technology. The 860 PRO and 860 EVO SSDs will be available later this month with MSRPs starting at $139.99 and $94.99 USD, respectively.